Wow - what a great event, wholly due to the massive amount of work done by the School Association. There were lots of stalls, activities and eating going on with perfect weather to accompany the day. The fair raised an amazing £3,600 so thank you to everyone for their generosity in time and money! Yet again, our KS2 choir performed brilliantly at the Summer Concert held at the Colston Hall. We had over 80 children on stage in lots of different colours to bring the stage to life with colour and fantastic singing. The theme was "books" this year so there were lots of songs from Matilda, Mary Poppins and, a big favourite, Beauty & the Beast. Mrs Steel worked her magic with the Year 3 choral speakers who were outstanding! Well done to Mrs Cunningham and Mrs Steel for their brilliant conducting as well! Congratulations to Mrs Moody and her team of Gladiators: Erin, Lilly, Sophie, Morgan, Barney, Henry, George and Kate, who were awarded the 2017 Reading Gladiator trophy in late June. In order to win they had to complete an art, drama and knowledge challenge and overcame challenges from seven other teams to do this! Mrs Andrews and her drama club have been working so hard over the last few months to put together their latest play "Mystery at Magpie Manor". Colourful costumes and sets created a wonderful setting which allowed the children to show off their acting skills and the audience of parents, carers and friends very much appreciated their efforts. Thank you to everyone who was involved but special thanks to Mrs Andrews for coming back to share her love of drama with the children and also to Mrs Sims for working so hard on the costumers and Mrs Bell for her support. Come and learn an instrument! Years 1 & 2 joined our orchestra on Tuesday afternoon to listen to them play "Jurassic Park" and hopefully inspire lots of children to take up an instrument. Quite a lot of our orchestra members leave this year to move on to secondary school so Mrs Cunningham and Mrs Alsop, with the future in mind, invited the younger children to listen to all the different musical instruments that are taught in our school and perhaps think about learning a new instrument. In particular, they are looking for flautists, cello and double bass players! If your child is thinking about learning a new instrument, please pick up a letter from the office, book in now and they could be joining in the orchestra from September onwards! Once again the hall was transformed into a peaceful and prayerful space for Lent. All children from Year 2 upwards had the chance to learn some of the key messages of Lent – forgiveness, hope, being kind to each other, and being thankful for what we have. Many thanks to all the parents who helped, and made the trail such a meaningful and spiritual occasion for the children. Thanks also to Helen from Horfield Church and Claire at Ebenezer church for their help in setting up and loaning materials for the trail. One volunteer wrote "I loved having 20 minutes of my day to reflect and to watch children reflecting. Also to have the space to be quiet and spend time with God. It's not usually what I have time for at work!" We would like to thank Mr Robertson for another wonderful Lent Trail at Horfield. What a great day we had! Many children dressed up as their favourite book character and were willing and able, not only to talk about the character, but also the book. Many of the costumes were highly original and it was lovely to see just how many children had designed and made their own outfits. The money raised will be spent on new books for the library. The "Where's Wally" treasure hunt organised by the School Association was also great fun and very popular with over 200 entries! Well done to everyone who took part and you should all have received certificates for taking part. The Year 1 dance group performed at the Colston Hall and were amazing! They were dancing to music that was brought back from Mrs Edwards' charity visit to Uganda and inspired by the book "The Lion Inside". They looked brilliant with their colourful costumes and face paint. The routine was delightful and had lots of applause from an enthusiastic audience. The performance culminated in choral speaking: "And that day they both learned, that no matter your size, we all have a mouse and a lion inside". Ms Moss would like to say thank you to all the parents and staff who helped her in the run up and on the day. We would like to say a massive thank you to Ms Moss who created the choreography moves, made all the costumes and gave a lot of her time to give the children this fantastic opportunity. As part of World Book Day, we were highly delighted to welcome M G Leonard, author of "Beetle Boy". Both staff and children were enthralled to listen to how she was inspired to write the book and what's coming next. Her love of beetles was obvious, explaining the different types of beetles which inspired her books. The children were given the opportunity to ask her questions, which she happily answered and then signed copies of her book. If you missed the opportunity to buy her books, please note that only Waterstones sell her books. Her second book "Beetle Queen" is already on sale and keep a look out for the series finale "Battle of the Beetles" in store soon! Mrs Kydd received an email the next day to let us know that Maya had a fantastic afternoon with us and wanted to pass on how amazing she thought the children were; they were well behaved and totally engaged ... and so were the staff as well! Father John and Helen held a special service in school to mark Ash Wednesday. It is the beginning of Lent – forty days leading up to Easter. At this time some Christians will have ashes marked on their heads to remind them to live more simply and prayerfully. Many children chose to be blessed, and have the sign of ashes. May we wish you all a peaceful and reflective Lent! A small team of Bristol teachers, including Mrs Alsop and Mrs Steel, led by Mrs Cunningham, have been working hard to write a new Music curriculum for Bristol. It is now being used by schools throughout Bristol and beyond! At the National Music Teacher Awards for Excellence on Thursday 9th February, the curriculum was award Best Print Resource, which is truly exceptional since they were up against stiff competition including Oxford University Press and ABRSM. Many congratulations to this inspirational team. Stages 17 - "The Lion Inside"
Children from Classes 3 & 4 have had great fun rehearsing with Ms Moss getting ready for Stages. There are lots of children involved with the dancing and they are working very hard to learn all the dance moves and are getting very excited to be performing at the Colston Hall soon. They all got together with their costumes on (but without make up!) to perform in front of the judges who were visiting our school from the UKLA and they were very impressed with the dance routine. As you know, we have been shortlisted for the School of the Year with the UKLA and yesterday two judges came to visit our school. They saw an amazing range of activities which exemplified just how well the teaching of English is embedded across the school. They toured the whole school, came and listened to the fantastic singing in the whole school singing assembly, watched a sneak preview of the Year 1 Stages performance, choral speaking performances from various classes .... and so much more! We hope that Linda and Christine were very impressed and enjoyed their day with us! Our Green Club led an assembly to share their message across the whole school about saving energy. It was "Switch Week" so the challenge was to see which class was the best at remembering to switch off all the lights, computers, projectors and save energy. The winning class was ........ Class 5! Key Stage 2 children were treated to a presentation by Joe Berger, author of "The Pudding Problem". Joe began life as a cartoonist and illustrator and this book was, he told the children, his first full length novel. They particularly enjoyed his tips on how to create simple cartoons. We were also grateful to Joe who stayed on after his talk to sign copies of his book that some children had already ordered. At Horfield we know how to celebrate Christmas! Mrs Peet and her team worked very hard as usual to put on a fantastic Nativity performance. This year's production was called " The Christmas Message". We were very proud of all the Reception children who did exceptionally well to learn all of their speaking words, dance moves and singing, ably helped by Years 1 & 2 joining in with their enthusiastic voices. Special thanks to Mrs Sims who still returns to school every Christmas to put together all the costumes. Hopefully you all saw our school nativity picture in the Bristol Post Nativity Supplement on Friday 16th January. We also said hello again to the students from the Bristol Old Vic Theatre School. The whole school squeezed into the hall to watch their xmas nativity performance called "While Shepherds Watched". As usual, it was a very slick, amusing, thoughtful, musical performance from the students and our children love watching them every year. Thank you BOV students for entertaining us again! A huge thank you to our cooks Nicky and Bev and the rest of the kitchen team for a lovely xmas meal this year. Tablecloths were set, ceiling lights were dimmed, christmas music was playing in the background with children and staff sat down enjoying a very tasty lunch. The Infants enjoyed party games, food and a visit from Father Christmas which of course was the highlight of the afternoon! The other year groups also enjoyed their own parties over the course of the week which got everyone in the festive mood! After several performances at various places, virtually the whole of our KS2 choir walked around the corner to Southmead Hospital. They were performing in the usual place in the atrium near the Sanctuary which is a great spot to entertain since a lot of the patients can look down through their inside windows and also any patients being wheeled around the upstairs corridor can hear over the bannisters. As usual, their singing was fantastic and it was also a real pleasure to listen to Lara and Lila performing "Little Donkey". One of our many Horfield traditions is to invite all of the lovely people who come into school and help in many different ways. We do this by having a xmas coffee morning, filling them up with coffee and tea, lots of mince pies and biscuits! They were treated to christmas carols and songs from a scaled down KS2 choir and our Year 6 Boys Choir. Many of our helpers are parents and grandparents who come into school to help with reading, group work, accompanying children on trips, walking up to swimming and many other activities. However, a lot of our volunteers do not have children here but still choose to spend time here with us and we are always extremely grateful for that extra help! Our friends from Ebenezer Church visited us again this Christmas with their Come Alive puppet show. This year's production was called "Oh Camel Ye Faithful". Again, the whole school (that's 420 pupils plus staff!) squeezed into the hall to watch their play which was hugely enjoyed by everyone! The end of the traditional Christmas celebrations culminated with our family candlelit service at Horfield Parish Church. It was a lovely occasion, with the church packed with children, families, staff and friends. The atmosphere created by the wonderful music and thoughtfully chosen readings meant that we were all able to reflect on the true meaning of the Christian message. As usual, the readers were confident with their able speaking and the choir sang two of their Christmas songs beautifully. Thank you to Mr Robertson for his creative thinking and organisation of the whole service. A very special mention must go to Father John Hadley who conducted his last Horfield School Christmas service as he retires later this year. Thank you Father John for keeping us in your thoughts and prayers over the many Christmases we have joined you at the church. Our final event of 2016 was the now infamous "Horfield's Got Talent". Miss Green and Mrs Taylor had been very busy the previous week watching auditions from every year group which included singing, comedians, dance groups, sketches, ballet dance, musicians and much more! On the last Friday afternoon, every child and member of staff packed into the hall to watch some great performances, including Mrs Howell's Year 6 gym club and it was evident from the show that, yes, we certainly do have lots of talent at Horfield! The climax of the afternoon was the staff flashmob to Slade's "Here it is Merry Xmas". Mrs Kydd tricked everyone at first by reciting the first verse of the song as a poem, with Miss Green and Mrs Steel singing the chorus in their sweetest angelic voices - it only came to true light once the voices of a few more staff joined in on the second verse. By the end, the whole school were singing and swaying away - an excellent, fun way to end the term! Several year groups were lucky enough to enjoy a variety of workshops on 9 December delivered by professional Shakespearean actor and director Peter Clifford. Years 1 and 2 shared the poems "Tarka Tarka Skunk" by Steve Webb and The Train poem (anon) through which the children were able to explore the rhythm of words. Year 5 looked at "The Listeners" by Walter de la Mare with a particular focus on how a poet and a reader of poems create atmosphere through words. Year 6 was very lucky to enjoy a drama workshop. Following on from their study of "Macbeth" in class, they closely examined the language and meaning of Macbeth's "Is this a dagger which I see before me?" soliloquy. Then it was time to set the scene on its feet by directing Peter in how they wanted him to act, speak and move whilst delivering the speech. In Year 6, Michael said that it gave the children the opportunity to see what Shakespeare was trying to say in his scripts. Alex stated that the intention of the writer becomes clear when the words are performed, and not simply read. Raji thought that the workshop had helped her to realise that you may not have a clear understanding straightaway, but that putting a scene "on its feet" really helps. Which, of course, was what Shakespeare intended! New books for our class libraries! Pupils from across the whole school choose new books for each of their class libraries. They were purchased using the commission earned from our Book Fair held in November so many thanks to all of you who bought books at the fair. We love the variety of the books they chose. The workshops were held over two days in the hall and every year group, including Reception, had a session with the Happy Puzzle Company. A big thank you to our School Association for funding these workshops. As a thank you for raising funds for an appeal at Southmead Hospital, we were invited to take some students to take part in a showcase event for their new robotic surgery. 20 of our Year 4 children walked into the atrium not quite sure what they were going to see! However, for two hours they were totally engaged in listening to the senior surgeon who uses the new robotic equipment and then they actually were given the opportunity to each have a turn in using the robot. Don't worry though, they were only practising using plasticine, not a real body! There were a lot of media personnel invited to the morning event and our children were there just at the right time to be involved in interviews and being filmed! Erin and Edwin appeared on BBC Points West in their lunchtime and evening news broadcasts - the BBC cameraman was most impressed with Erin's natural ability in front of the camera! You can watch the proof below in the captured news clip! Mrs Pritchard and Mrs Hilton who accompanied the children were delighted with their behaviour and excellent attitude on this trip. We always enjoy celebrating Harvest at Horfield and this year was no different. Parents, staff and children appreciated the lovely singing and readings that were performed by various year groups in our assembly on Wednesday 19th October. Plenty of fresh and tinned produce was brought in by the children and displayed throughout the day in the hall. Most of the produce was then donated to North Bristol Foodbank and the fresh produce was sold and the proceeds donated to the Little Sisters of the Poor. Every child was also sent home at the end of the day with an envelope full of "seeds of hope" to plant and grow at home. 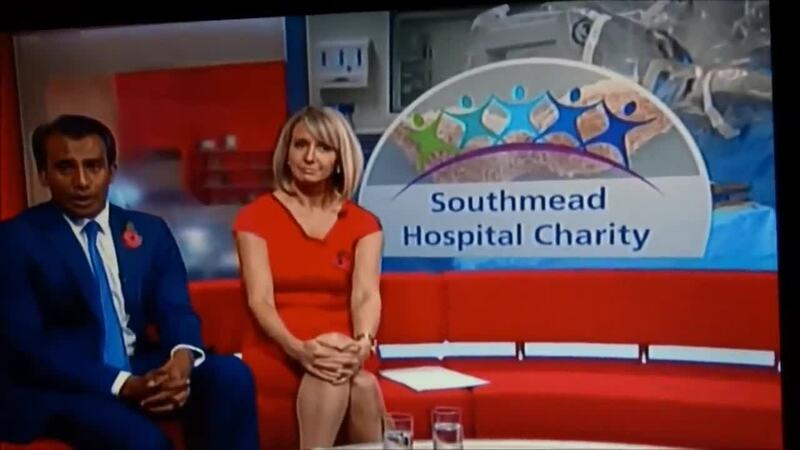 We were asked again this year by Southmead Hospital to take part in their fundraising day "Hero for a Day". The children donated a £1 and then were allowed to dress as their favourite hero. We had lots of different icons represented on the day; Barack Obama, the Suffragettes, sports starts, Olympic heroes, the Queen, Roald Dahl, and many many more! Thanks to all the contributions we managed to raise £310. On Tuesday 27th September our school enjoyed celebrating International Friendship Day. The day began with all the School Councillors joining Nick James, a master kitemaker who has been to our school on many occasions, to make their own kites with messages of friendship attached, which Nick then chained together. There was also a special assembly which parents were invited to. We sang songs of friendship and unity; Ethan and Zeke need a special mention for their duet, Emily sang a solo during one of our favourites "Refuge" and Year 2 children sang and signed at the same time. Year 5 children read haiku readings from the Summer Challenge and children representing four of the main faiths in our school read passages from their holy books. It showed powerfully how peace and respect for each other is common to all world religions. Father John also attended our special assembly and his closing words sent a very clear message to us all about the importance of treating everyone as brothers, sisters in one human race. As a final celebration, the choir sang on the field after school, our dancing group performed and the School Councillors flew their kite train. Thank you to one of our parents, Zoe's mum, Mrs O'Connor, for suggesting that we have this celebration day. A big thank you to Mrs Cunningham and Mr Robertson for organising the whole day. We are well known at Horfield for having a super KS2 Choir but did you know that we now have a boys Choir? One of our music teachers, Mr Lawrence, who has been teaching voice lessons at Horfield for at least 10 years, has brought together a group of Year 6 boys who will be rehearsing every Friday morning. After just two rehearsals, their repertoire already includes Bring him Home from Les Miserables ....look out for their inaugural performance near Christmas!